President Foley, Speaker Scheer, Members of the 105th Legislature, Tribal Chairmen, Distinguished Guests, Friends, Fellow Nebraskans, and of course, our First Lady, my lovely wife Susanne—good morning! And it is with the same spirit and determination that we must approach the work before us. Our families, our friends, and our neighbors are relying on us. What’s more, we have a chance to give a voice to the voiceless, to improve lives, and to craft policies that build a brighter future for generations to come. I am excited to serve with each and every one of you to grow Nebraska. I know that unnecessary regulations hamper job growth. This year, we need to continue to get rid of unnecessary regulations to empower everyone from car sales people, barbers, and cosmetologists to audiologists and massage therapists. We’re going to help people who want to work in these professions get to work more quickly. Thank you to Senators Albrecht, Craighead, Geist, Erdman, Larson, Lindstrom, Lowe, and Riepe for introducing bills to cut red tape. This is an opportunity for us to put our Nebraska grit to work like Don Stratton. Let’s roll up our sleeves and do what needs to be done to chart a course for future prosperity. It’s not just Lincoln reaching into their pockets, it’s Washington, D.C.
We can’t control what happens in Washington, but we can here in Lincoln. Let me tell you, our people get frustrated when they hear us talk about finding “revenues,” “new resources,” and “rebalancing.” They know those are code words for raising their taxes! Do you know it’s been 20 years since middle class Nebraskans saw a cut in the income tax rates? Nebraskans look at us and wonder why it’s so hard for us to let them keep more of their money. Speaking of grit, there is one other thing I didn’t tell you about Don Stratton. After several months of surgeries and rehabilitation at Naval Hospitals, he was sent home to his parents in Red Cloud. Then after several more months of recuperating, Stratton reenlisted. That’s right. He reenlisted. Today, the Office of Governor Pete Ricketts announced that the Governor will travel the state to unveil new infrastructure priorities identified by the Nebraska Department of Roads (NDOR). U.S. Senator Deb Fischer will travel with the Governor for Friday’s events. Former Nebraska Governor Kay Orr will join the announcement tour for both days. Additionally, State Senators Jim Smith of Papillion and Lydia Brasch of Bancroft will appear in Lincoln and West Point respectfully. Over the last several months, NDOR has held public input events to identify new infrastructure priorities to receive funding from the Build Nebraska Act (BNA) and the Transportation Innovation Act (TIA). The BNA, championed by Senator Fischer during her time in the Unicameral, set aside a quarter cent of existing Nebraska sales tax revenues for roads construction. The TIA, one of Governor Ricketts’ top legislative priorities in 2016, commits funding to complete the expressway system originally envisioned by Governor Orr. The projects announced at these events will be funded by the BNA and the TIA. At each stop, Governor Ricketts and others will deliver brief comments highlighting the new project priorities. The public is invited to attend any of the following stops. Note: The Lincoln news conference will be livestreamed. Click here to watch. Governor Pete Ricketts issued a statement honoring the life and service of former First Lady Nancy Reagan. LINCOLN – Today, Taylor Gage, Public Relations Director for the Office of Governor Pete Ricketts, issued a statement following an accident involving a vehicle carrying the Governor. The male driver of the pickup was transported to the hospital as a precaution with minor injuries. It is the understanding of the Office of the Governor that the driver of the pickup violated a stop sign. Interested parties are encouraged to check with the Lincoln Police Department for the police report to confirm whether the driver of the pickup was cited. Governor Pete Ricketts sent a letter to refugee resettlement agencies in Nebraska to urge them not to pursue resettlement of Syrian refugees. “Nebraska is a welcoming place for families seeking a home to live, work, and raise a family. While I understand the danger and persecution many are facing in the Middle East, it is important that our state and our nation consider the safety and security of Nebraskans and Americans first in any refugee resettlement efforts. The terrorist attacks that occurred over the weekend in Paris are a solemn reminder of the reach and strength of ISIS and their agents. “Veterans Day provides an opportunity to celebrate the commitment and sacrifice of our state’s military heroes. It is a day deeply steeped in patriotic symbolism commemorating and honoring generations of past and present military service members and their families. Gov. Pete Ricketts issued a statement following ConAgra’s announcement that they would restructure their operations and move their world headquarters from Omaha to Chicago. “During our conversations over the past several weeks, ConAgra’s CEO Sean Connolly told me that any changes made in Nebraska would be a part of a larger restructuring of the company to improve their operations. “While I regret ConAgra’s decision, it is a reminder why we must continually look for new ways to ensure our tax rates and incentive programs remain competitive, and it is also why I have dedicated two trade missions to highlighting investment opportunities in our state. “Across Nebraska on Independence Day, Nebraskans perform annual traditions as they gather to watch fireworks, grill on the back porch, march in parades, participate in community-wide festivals, and share the holiday with family and friends. While these rituals may seem commonplace, they are at the heart of who we are as Nebraskans and Americans as we celebrate the 239th anniversary of the signing of the Declaration of Independence. 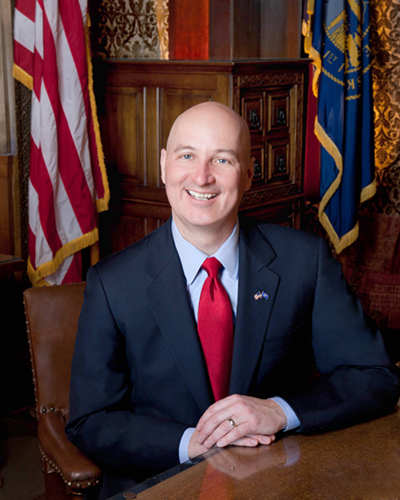 On Independence Day, Governor Ricketts will participate in 4th of July parades in Ralston, Seward, and Central City. Additional details about his schedule can be found at www.Governor.Nebraska.gov.